A blue pencil and a red pencil. A sheet of dotted paper. 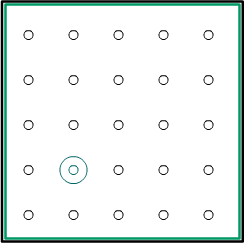 To get four dots of your colour in a line. Together, decide where to place the origin (0,0). It can be on any of the points on the board. Next, choose who will be blue and who will be red. Blue goes first and chooses a point. Blue has to write down the coordinates of the point in relation to the origin. If they get the coordinates of the point wrong, they don't get that point. 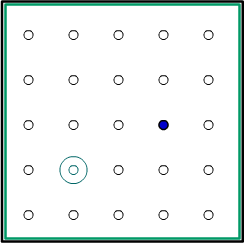 What are the coordinates of the point that Blue has chosen here? Then Red chooses a point and gives its coordinates. Keep playing until one person has four dots in line of their colour! Games. Compound transformations. Practical Activity. Tangram. Visualising. Interactivities. Working systematically. Coordinates. PrimaryGames-Number. PrimaryGames-Geometry.